On the third day of Conference of Parties (COP-22) on Wednesday, being held at Marrakech in Morocco, the India Pavilion witnessed three side-events that focused on the initiatives in afforestation and Reducing Emissions from Deforestation and Forest Degradation (REDD+) in India, ecosystem and climate change and sustainable transportation. During the first session on “Afforestation and REDD+”, experts highlighted that forests play a crucial role in mitigating climate change, particularly in India, where nearly 25 per cent of the area has tree cover. The Government has asked the forestry sector to help the country meet its goal of creation of 2.5-3.0 billion tonnes of additional carbon sinks, as per the Nationally Determined Contributions (NDCs). This target will be met using a variety of means, including afforestation, reforestation, and agro-forestry, conducted through community participation and mechanisms like REDD+. India has begun implementing REDD+ pilot projects, developing protocols for improving measurement, reporting, and verification and safeguard information systems. Emphasis was also placed on promoting the exchange of information and present potential collaborations among South Asian countries that share Himalayan and tropical ecologies. In the second session on ecosystem and climate change, discussions were held on the role of forest in climate change mitigation and adaptation. Climate change alters existing biome types and can cause forest dieback with consequent loss of biodiversity. Various forest conservation oriented acts and policies in India are contributing to a reduction in CO2 emissions, stabilisation and improvement of carbon stocks in forests, and conservation of biodiversity. India’s forests serve as a major sink of CO2, offsetting around 12 per cent of the total greenhouse gas (GHG) emissions of the country. Showcasing India’s efforts on sustainable transport solutions, the country’s Ministry of Railways, with its technical partner, Council on Energy, Environment and Water, hosted the third session on “Sustainable Transport Solutions”. Special Secretary, MoEFCC, R R Rashmi, pointed out that India is on the road to managing its transport sector emissions. “In addition, there have been efforts to decrease fossil-fuel dependence in the transport sector, which have been incorporated by moving towards cleaner sources of energy and increasing the share of renewables in driving mobility,” she added. 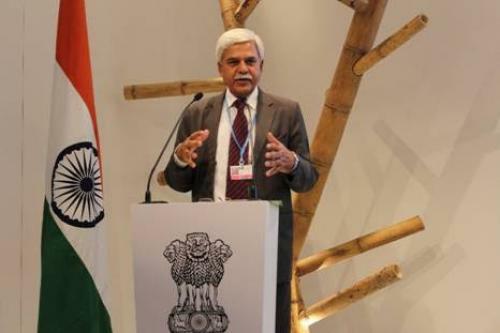 India has focused its low carbon initiatives on the development of railways, waterways, Mass Rapid Transport System and other forms of public transport. Initiatives such as the Dedicated Freight Corridors and the Sagarmala projects on development of waterwayswere discussed by Deputy Secretary, Ministry of Shipping. The initiatives are aimed at increasing the share and volume of freight traffic on the more energy efficient rail and water based transport modes. The representative from Council on Energy, Environment and Water highlighted that the Indian Railways has taken a leadership role by planning to substitute its petroleum use with alternatives like bio-fuels, and consistently pursuing a policy of railway electrification through renewable sources of energy, with potential reduction of 138 MT of CO2 by 2030.